I was spending the afternoon in a Katy, TX park (you can't stay overnight) and there was a severe weather alert in effect. A front was supposed to come through and chase away the muggy low-80's weather and replace it with more Fall-like low humidity 70's. In less than 15 minutes it got dark and extremely windy. I got up from where I was working on my laptop in order to tighten down the escape hatch vent that is in the ceiling over my bed but before I could get there an extremely powerful gust of wind first ripped the hatch to it's wide open setting and then an even stronger gust ripped the hatch completely off the top of the Tank! It happened in less than a couple seconds and I stood looking up through my roof at rapidly approaching storm clouds (up to two inches of rain was forecast). 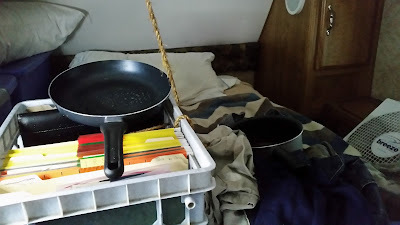 Racing outside I was able to catch the pinwheeling hatch cover and bring it back into the Tank but by now raindrops were starting to fall through the open hatch onto my mattress with the high winds continuing unabated. I got a piece of rope I keep inside the Tank and tied it to the hatch cover's crossbar and fit the cover up onto the roof of the Tank through the escape hatch. Instantly the wind caught the cover and would have ripped it out of my hands had I not had the attached rope wrapped around my left hand. The cover was now shielding most of the hatch cover but I couldn't get the hatch to fit over the entire opening because the screen part of the assembly was bent and in the way. 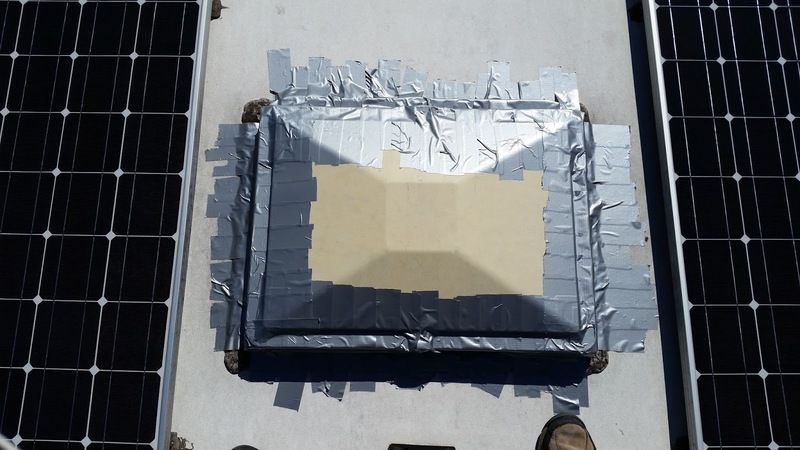 The only thing I could think of was to flip the screen out of the hatch and up onto the roof, allowing the cover to be about 95% "in place" but rain was getting blown by the powerful wind through spaces the hatch cover wasn't sealed around. Garbage bags "sealing" the space around the roped down hatch cover. 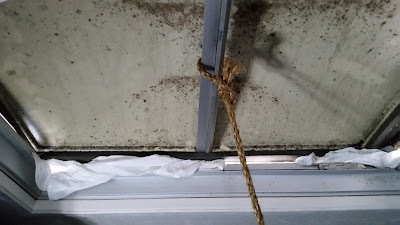 I got a roll of kitchen garbage bags and stuffed them one at a time into the spaces allowing the rain in beneath the hatch cover and they ended the direct entrance of rain but still allowed some slow dripping through the hatch opening (it was a virtual monsoon outside at this point). So I got every pot, frying pan and mixing bowl out of the kitchen cupboard and placed them underneath where the drips were dropping. A frying pan protecting my files from rain drips. With the situation (mostly) stabilized I got online and found a replacement hatch cover assembly on Amazon for $299 and ordered it, although it wasn't eligible for Prime two day shipping so I won't have it until next week. I didn't have much choice as the old hatch assembly was trashed and unable to be repaired. I emptied the pots and pans as needed until the storm finally blew through. I'm hoping the tape will keep head winds from ripping the hatch off while driving. I'm also keeping the rope tied down to the hatch cover's crossbar inside the Tank so if the duct tape fails the hatch doesn't go flying off the top of the Tank and into someone's windshield. Fingers crossed until the replacement hatch gets here next week! I'll do another post around the installation.